A double cable (or horseshoe cable) looks intricate but is easy to knit. 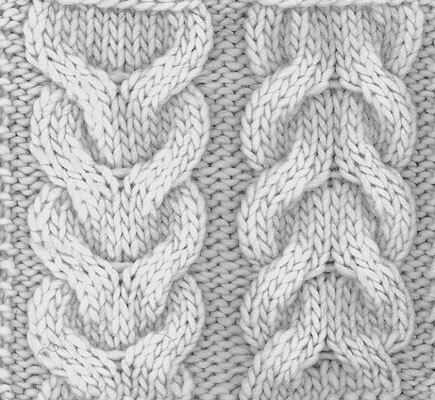 Try knitting this sample panel of double cable. The panel is 18 stitches (the cable is 12 stitches wide with 3 set-up stitches on either side of it). Rows 1 and 3 (RS): P3, k12, p3. Rows 2, 4, and 6: K3, p12, k3. Row 5: P3, sl next 3 sts to cn and hold in back, k3, k3 from cn, sl next 3 sts to cn and hold in front, k3, k3 from cn, p3. A double cable is really nothing more than a right cable next to a left cable. You can turn the cable upside down by working a left cable first and then a right one.